Colonial White Granite Dark Cabinets Backsplash Ideas for your review: I can call this combination is an overall effect of striking opposite colors with a smooth touch in kitchen remodeling. Usually, Colonial White Granite Dark Cabinets Backsplash Ideas is a happy playmate with stainless steel kitchen appliances. 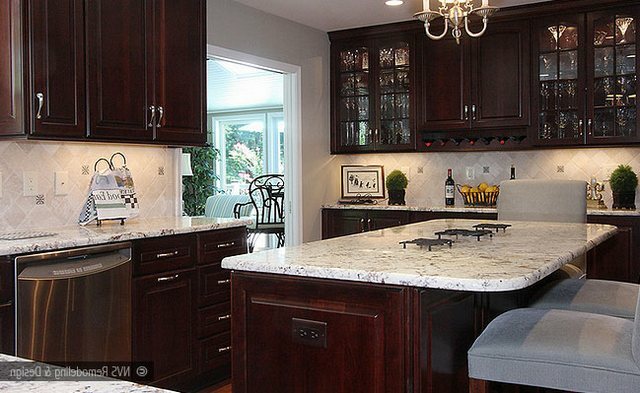 Colonial White Granite Dark Cabinets Backsplash Ideas is very joyful when you would like to pick the right backsplash. As a rule of my education, the material and the characteristics of the backsplash, the color and stain of the dark cabinets will be named. I will also show some Kashmir White Granite Dark Cabinets Backsplash ideas. Let me talk about good matching backsplash colors: Colonial White Granite Dark Cabinets Backsplash Ideas is almost happy with white, soft beiges, earth tone browns, sage greens and soft browns. Alluring Replacement: Colonial White Granite Countertop article can also be very helpful your color and material selection. 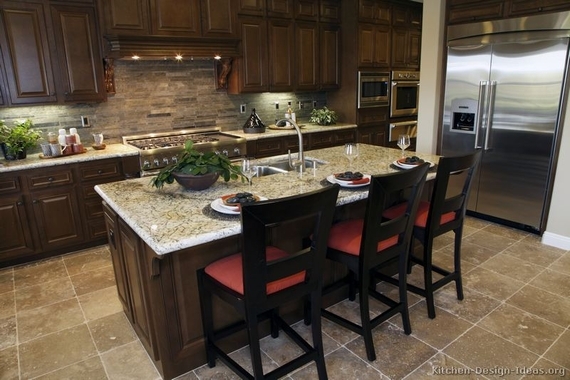 The material for the backsplash can be ceramic, glass, and travertine, or slate. The type of the backsplash tile would be subway, matchstick, square and mosaic. Picture Credit: NVS Remodeling and Design. Backsplash speaks.Natural color travertine square backsplash set up diagonally and connections are very neat. Chestnut stained cherry cabinets with glass doors and colonial white granite countertop and island top. I have been haunted to this beauty. Picture Credit: Luxury Bath and Kitchens via Houzz. Dark espresso cabinets, colonial white granite and glass subway backsplash embellished with glass mosaic backsplash under the stove hood. Very attractive contrast. Color of subway backsplash could either Sage or tumbled gray. Picture credit: Kitchen-Desing-Ideas.org via heimdecor.net Very good combination of colors . Dark tones natural slate backsplash matches with flooring, Maple Cabinets with toffee glaze and granite countertop are like a dancing couple and all over image mesmerize you. The flooring is still in search. I will let you know the exact name. 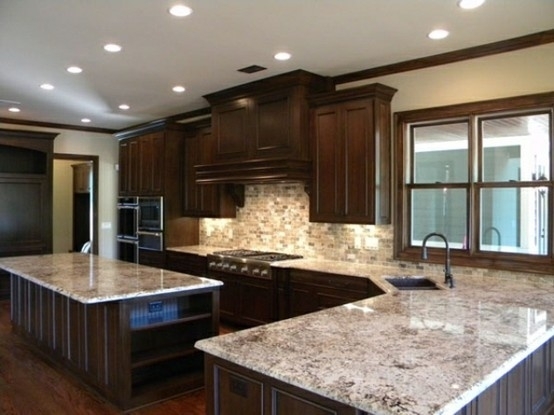 Picture Credit: Indulgy.com Cherry cabinets with bordeaux finish and mixed brown ceramic mosaic backsplash. Very good idea for open layouts when you have natural lighting in your kitchen. Picture Credit: Synergy Design and Construction. Worry free design, worry free mind for kitchen remodeling. Duraspreme Mocha Finish Cherry Cabinets and Hutch style China, Maniscalco, Simpson Dessert , Waterfall Glass Tile Zulu is the upper part of the backsplash. Lower part of backsplash is same brand Simpson Blend Mini Subway glass tile. 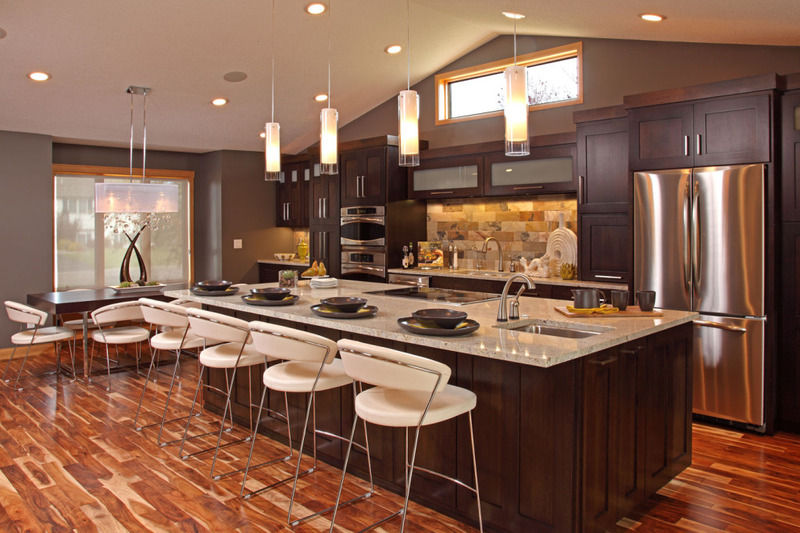 Kashmir whites shines in the kitchen and flooring completes the puzzle. Ulivo by Capri Woodlands Tile.The same design can be easily used for Colonial White Granite Dark Cabinets Ideas. I am looking forward to seeing the speaking minds about Colonial White Granite Dark Cabinets Backsplash Ideas. Thank you for your time and thank you for reading.